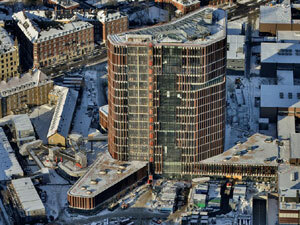 With more than 7.000 elements in more than 1.000 variants the new Mærsk Building in Copenhagen really utilizes the mouldabilty of GFRC from BB fiberbeton A/S. From the bands between the copper toblerones on the complex façade to the internal hallways and large skylights, Glass Fiber Reinforced Concrete (GFRC) from BB fiberbeton A/S is a distinct part of the building expression of the new research center. BB fiberbeton A/S has delivered elements to 3 different entrepreneurs on the project (Waagner-Biro Ag, N.H. Hansen & Søn A/S, Elindco Byggefirma A/S). 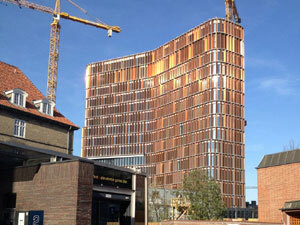 The unique shape of the building has required elements to be produced with more than 200 different radii with return edges – showing the unique benefits of GFRC. Elements are produced with a range of different systems for mounting ranging from stud frames, embedded steel brackets and recessed holes. All as per request from entrepreneurs to make mounting easy and smooth. 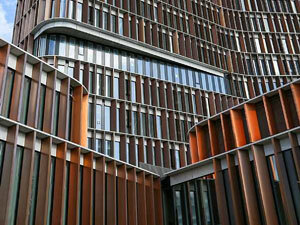 All GFRC from BB fiberbeton A/S on this project is produced in-colored light grey BBf no.92. 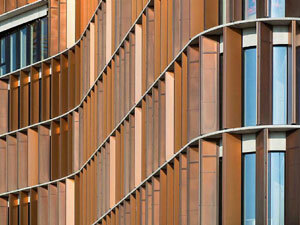 Most elements on the façade consists of 3-5 units mounted on a simple L-shaped stud frame. The large top elements with edge return are cast with the stud frame and the other elements are mounted to the stud frame before mounting on the building. 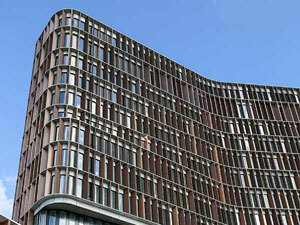 GFRC was chosen as the material for the project due to both its aesthetic and environmental friendly properties. With elements of only 12 mm thickness less cement is used and transportation costs are lowered. In addition, production of GFRC is a non-toxic and green production with very limited use of both water and power. These properties of GFRC from BB fiberbeton A/S are a good match with the collective thoughts behind the intelligent building.